Carl van Mander writes that Pieter Bruegel was said to have swallowed up the Alps and spit them out as pictures after returning from Italy to the Netherlands. 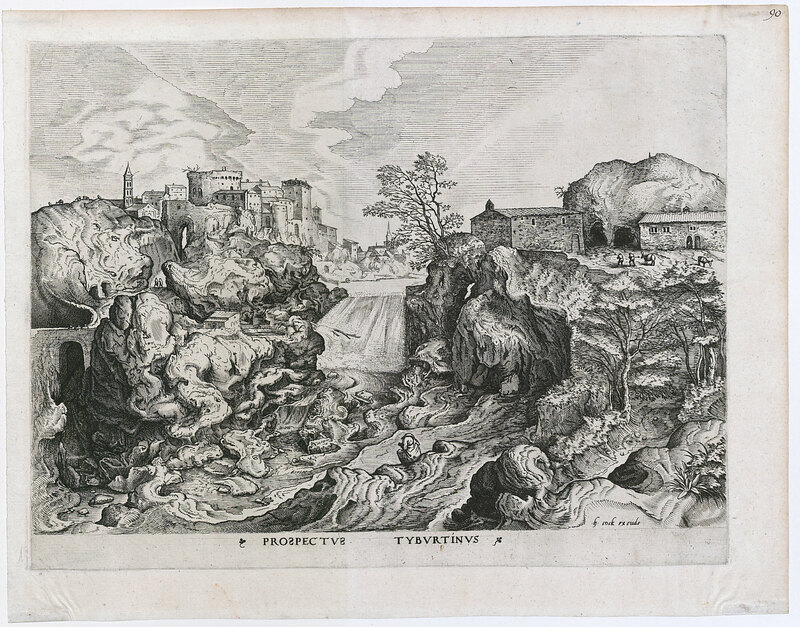 Looking at the image in front of us, it is tempting to think that the artist disgorged the half-digested mountains into a riverbed near Tivoli and sketched the following scene as a souvenir of the gruesome event. Of course we don’t have to adopt the metaphor of coughed-up cud when trying to describe this picture. We can imagine instead that the vast belly of the earth has been sliced open, exposing her pungent, pulsating entrails. Like the tiny animal forms dotting the left-hand horizon, the spilled-guts metaphor recalls a secret buried deep within this same Roman landscape: namely the bones of a thousand sacrificial sheep sliced open by ancient diviners seeking knowledge of nature’s inner workings. According to Livy, the examination of animal entrails (exta) was central to the practice of haruspicy, a style of divination originating in Etruria but gaining importance in Rome around the time of the second Punic Wars. During the Renaissance the art of the haruspex was also known by way of Cicero’s De Divniatione, as well as through sculpted depictions of sacrifices and the sacrificial altars themselves. Through scrupulous study of these sources Italian scholars and artists helped to rekindle the forms of divination, the idea of divination – but never the stench of it, quite as we find it in Bruegel’s gushing riverscape. Bruegel’s Italian counterparts were generally far too decorous to depict wounds, even when the subject cries out for it. The women scream in horror as the soldiers butcher their children in Marcantonio’s famous print after Raphael, but there are no wounds, there is no blood. Instead we are confronted with a forest of statues, bodies of a piece with the lapidary cityscape clinching their formal logic. Raphael made tangible the decorous, rational Hadrianic Rome which the humanists labored to reinvent through measured prose and buildings. Accordingly, the Roman campagna dear to the classicists was a composed and compliant place, shaped for millennia by the sweat of farmers and the will of princes. It would be wrong to assume that Bruegel couldn’t fathom the Italian conception of a landscape ennobled through cultivation and inhabitation. The obedient pockets of buildings forming the background of his Tiburtine landscape indicate a real sensitivity to the native point of view. The flattened-out forms of the buildings at right recall the delicate sketches made in the Tuscan countryside by Fra Bartolomeo, and the snug cityscape at left conjures forth the distant views in a thousand Italian altarpieces. Even the tree silhouetted at center, addressing the city with a relaxed and dignified nod, seems at first to have been transplanted from an Italian picture. But upon further inspection the apparent fellowship of tree and city turns out to be a trick of vision, a trap for the sentimental eye. In fact the tree is far closer to us than the felicitous cityscape: it fumbles for a foothold in the middle ground, where the picture of tranquility quickly crumbles into chaos. The lower half of the image presents a serious problem to the viewer raised on Italian-style landscapes. The gaping, soggy mess at center hardly seems a fitting foundation for the settled scene above. No wonder so many of Bruegel’s critics have considered him to be a bumpkin without a jot of propriety. Compositionally, this print is a joke. It is a subtle and profound joke, worthy of a comic master, hinging on the contrast between civilization above and raw nature below. Bruegel seems to poke gentle fun at the Lilliputian inhabitants above, like the two big-assed men leading an overfed donkey across a tiny patch of land at right. Content with their close-fitting frontiers, they turn their backs on the spectacle below, where their monstrous mother the earth writhes like an eviscerated ewe ready to shake off her picturesque encumbrances at any moment. What a world, where even country folk are blind to the earth’s true nature! Where are the diviners now? Does anyone sense the convulsive power of the prodigious living form on which we eat and sleep and work? This image contains an answer: it is the artist who sees and understands nature. Bruegel extends his gaze beneath the tranquil cityscape and discovers a terrible energy, more powerful than any human agency, in the swirl of rocks and water. And what about the cloaked figure seated down towards the water, intently bent on reading or writing or drawing? Surely he also strives to see and to know, poised as he is on the edge of the aqueous laceration, as if ready to leap back into the womb of his mother in order to learn her secrets.